FIGURE 11-4 The common steps in the treatment of domestic water. control pH and assist in the flocculation process, (6) filtration (through sand beds), and (7) a final chlorine treatment. Activated carbon may be used in some circumstances to absorb traces of material that give odor or taste, and a fluoride source (e.g., Na2SiF6) may be added as a dental health measure. 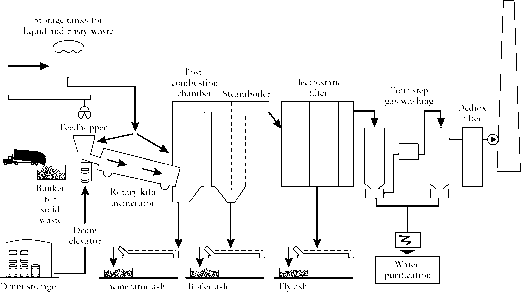 Figure 11-4 shows a schematic block diagram of the process. The small amounts of calcium and sulfate ions left in solution are not harmful. This reaction is essentially complete at normal pH (the room temperature equilibrium constant is 4.5 x 10-4mol2/liter2). HOCl is a weak acid (Ka 3 x 10~8) and will be present as both HOCl molecules and OCP ions, with relative amounts depending on the pH. (Concentrations will be equal at pH = pKa; Chapter 9.) These species are referred to as free available chlorine. The HOCl molecule is most effective as a disinfectant, presumably because it can enter bacterial cells more easily than the ion. Oxidizing conditions must be maintained throughout the entire distribution system to prevent redevelopment of septic conditions while ensuring that the chlorine content is not excessive near the addition point. The stability of the hypochlorite with respect to disproportionation to CP and ClO3 is dependent on the pH, which may require adjustment for this reason, as well as to reduce the corrosive properties of the water. Although chlorination oxidizes many organic materials, it does not oxidize all. It can result in chlorination of some molecules, with the possibility of producing chlorinated hydrocarbons with significant health hazards (Section 8.3.1). Chloroform is one of the potential by-products of water chlorination that is of concern. It may arise from the well-known haloform reaction, in which compounds that have structures CH3C(O)R or CH3CH(OH)R, or can be oxidized to form these structures (e.g., olefins) undergo a reaction in which the hydrogens on the carbon adjacent to the one carrying the oxygen undergo a dissociation to form the carbanion intermediate [CH2C(O)R]~ followed by displacement of the Cl of HOCl to give the chlorinated product. This continues until all the hydrogens have been replaced, whereupon hydrolytic cleavage of the C—C bond releases chloroform, CHCl3, as illustrated in the following reaction scheme.